Jeff Bingaman, senator from New Mexico will be the new chair of the Senate Energy and Natural Resources Committee. He says the Arctic National Wildlife Refuge is now safe from drilling proposals. The oil industry’s political representatives can count the votes too, and they agree. Story by James W. Brosnan. Albuquerque Tribune. Bozeman Chronicle article by Scott McMillion. GARDINER, MONTANA. Eight Yellowstone bison calves, captured and orphaned by state and federal agencies, escaped the Corwin Springs quarantine facility near Gardiner, Montana on Monday of this week. “This quarantine is a failed experiment that should be stopped at once,” said Buffalo Field Campaign (BFC) Project Director Dan Brister. “Bison are escaping and wild animals are entering. By definition quarantine is ‘a strict isolation imposed to prevent the spread of disease.’ The incompetence of Montana Fish, Wildlife, and Parks and the Department of Agriculture in allowing the quarantined animals to potentially mingle with wild animals is astounding,” he added. Bighorn sheep and mule deer were observed inside the facility last winter and spring. Montana Fish, Wildlife & Parks (FWP) and USDA’s Animal & Plant Health Inspection Service (APHIS) run the joint state-federal quarantine feasibility study under the premises of creating “a disease-free herd,” and restoring “wild bison” to public and tribal lands. The captured wild calves are living in domestication. They are imprisoned within double-electric fences, wear ear tags and are fed hay like livestock. The bison calves are routinely handled and experimented on by scientists. After somehow managing to escape through a double fence, the domesticated bison remained in the immediate area and were easily recaptured. “Quarantine is the antithesis of buffalo restoration. Wild buffalo restore themselves naturally, every year when members of the Yellowstone herd attempt to migrate, but the government keeps getting in the way and killing them for trying,” said BFC spokesperson Stephany Seay. The agencies obtain the wild Yellowstone bison calves from capture and slaughter operations carried out under the Interagency Bison Management Plan (IBMP). The IBMP is a taxpayer-funded state/federal plan drafted at the urging of Montana’s livestock industry. Approximately 100 bison calves have been captured from Yellowstone and transported to the facility. Over the summer, 48 calves were removed from quarantine and sent to slaughter to be dissected and studied. None of the calves killed were infected with brucellosis. Wild bison have never transmitted brucellosis to domestic cattle, even where they have coexisted for decades (Grand Teton National Park). Representatives from the Buffalo Field Campaign, a wild bison advocacy group, toured the facility last spring and were shocked at the conditions in which the wild calves were being held. American Bison once spanned the continent, numbering between 30 and 50 million. The Yellowstone bison are America’s only continuously wild herd, numbering fewer than 4,000 animals, less than .01 percent of the bison’s former population. The Buffalo Field Campaign is the only group working in the field every day in defense of America’s last wild buffalo. Video, photos and more information are available at http://www.buffalofieldcampaign.org. Kathie Lynch, one of our Wolf Recovery Foundation directors, has just written one of her ever popular reports of Yellowstone wolf observations. Thanksgiving in Yellowstone! If you want to escape the holiday frenzy, head to Yellowstone–where theonly crowds you’ll find are the herds of bisonstanding around in the road, and instead of holiday”muzak” at the mall, the howl of the wolf will fill your ears. My five day visit (November 22-26, 2006) featured avery special treat–I got to see the Druids! The last time I saw the Druid Peak pack was July 4, just beforethey departed Round Prairie for summer in the high country. While they have dropped in for occasionalvisits to the Lamar Valley since then, this was myfirst chance to see them. My first Druid sighting was a big, beautiful graypup (now almost adult size) north of the road in the Soda Butte Valley as the Druids traveled east from the carcass. The pup was a crack up! He was rolling around on his back in the snow, wiggling all over and waving all four legs in the air! That one minutesighting was my only wolf for that day, but I couldn’t have been happier–I had seen a Druid! The next day, I was even luckier. I arrived just in time to see 10 Druids running full tilt just below the tree line in the same area. They were so full of life and just seemed to be enjoying a gallop in the snow. A couple of bull elk scattered in their path, but I don’t think they were really chasing them–it looked like they were just out for a joy ride! Of course, with so many pups, you have to expect a lot of enthusiasm! The Druid count lately has consistently been “only” 14 (Only!…Think about just four Druids a year ago! ), nine black and five gray. Unfortunately, one black pup has not been present inrecent sightings. I sure hope the missing one is not that brave little fellow who was left behind for four days at Round Prairie last July before being rescued by the pack. If a black pup is indeed missing, the pack would include four adults (alpha 480M, alpha 529F, 302M, and the uncollared gray female) and 10pups (six black and four gray). The other big news had to do with the Agate Creek pack–they were on the move into new and hostile territory. One morning, all 13 Agates (led by venerable alpha male 113M and alpha 472F, a former Druid, and sired by 21M) were in Yancey’s Hole (north of the road, between Tower Junction and Petrified Tree). At the same time, all eight of the Hellroaring packwolves (led by alphas 287M and 353F) were on a carcass, easily visible below Hellroaring Overlook. The three Hellroaring black pups were having a grand old time jumping on and off of rocks and playing tug-o-war with big, flappy pieces of hide. returned in the afternoon and saw wolves in the exact same place and on the same carcass that it was now a different pack. Only the fact that the Hellroaring pack only has two grays, and the pack I saw in the afternoon clearly had more grays, gave it away. Both packs have collared black-turning-silvery gray alpha females and also a collared dark black wolf, so it’s easy to make the wrong assumption, if you aren’t expecting the unexpected! In other pack news, the 13 member Oxbow Creek pack (formerly 536F’s Group) was often visible in the general area north of the road between North Butte and Hellroaring. The eight member Slough Creek pack has been a bit elusive, with occasional sightings in the Slough Creek area, but they are often gone for several days. A couple of the Unknown Group wolves (which caused such trouble for the Sloughs last April) have even been seen in the Little America/Slough area recently. The Leopold pack, possibly 18-19 strong, including 12 pups, was sometimes visible far, far away in their traditional Blacktail Plateau territory. (and the resurrected eight member Swan Lake pack), north out of the Park, or south into the Park’s interior. The Agates have already made forays last summer south to Canyon and the Hayden Valley pack’s territory. It looks to me like there is a loomingpotential for a lot of inter-pack territorial rivalry, especially when the breeding season arrives in early February. The annual Early Winter Study is going on from November 15 to December 15. During the month, crews of three extremely dedicated volunteers spend every waking moment documenting each and every detail about their assigned pack (the Leopolds, Sloughs or Hellroarings.) The only problem is, the packs don’t always cooperate, and some days it’s hard to even find your wolves! If you still need more reasons to visit Yellowstone in the late fall/early winter, consider all of the other awesome animals who are still out and about (sans the bears, of course). In one hour of watching the bison carcass near Hitching Post, I was treated to a procession which included a beautiful red fox (clever, and quick too! ), a golden eagle (who made everyone scatter just by lifting his mighty wings), six big, bushy coyotes, and the usual assortment of magpies and ravens . . . truly a Thanksgiving feast for the masses! The red foxes have been particularly obliging and photogenic lately, as have the bighorn sheep in the Gardiner River Canyon (between Gardiner and Mammoth). The big guys are in the rut and making the rocks tumble off the almost vertical canyon walls as they cling to them and battle for the ewes . . . truly a sight to see! Now and always, we should be so very thankful that we have the wolves and the rest of our animal “family” in Yellowstone to come “home” to at Thanksgiving . . . or any other time of year! Note from Ralph Maughan. Doug Smith at Yellowstone Park told me today that the Agates had just chased the Sloughs way up Slough Creek to McBride Lake and maybe beyond. He said the Agates have been really “flexing their muscles.” Kathie describes the Agate’s chase of the Hellroaring Pack above. Federal officials are investigating the killings of two wolves in the Clearwater region of north-central Idaho, and in November wolves have killed one cow and one calf, both east of Cascade. The radio collar from the alpha male of the O’Hara Point pack was found and turned in by a deer hunter in mid-November. The pack roams the South Fork of the Clearwater, and the wolf was last located alive on October 4, 2004. The collar has been turned over to the U.S. Fish and Wildlife Service law enforcement, and the death is under investigation. An untagged adult female gray wolf was found killed south of Grangeville on November 19. Her death also is under investigation. The total documented wolf mortality including all causes is 60 so far this year in Idaho. On November 9, federal officials confirmed that wolves killed a calf on state land east of Cascade. Idaho Department of Fish and Game authorized the removal of two wolves. A week later, on November 17, officials from the U.S. Department of Agriculture’s Wildlife Services confirmed wolves killed a cow on private land southeast of Cascade, an area where wolves of the Orphan Pack have killed livestock in the past. Traps were set. Wolf control actions, authorized by Fish and Game and carried out by the federal Wildlife Services, are in no danger of jeopardizing wolf recovery in Idaho. The Fish and Wildlife Service considers the wolf recovered in the northern Rocky Mountains. Federal officials are working on a proposal to remove wolves from the endangered species list in Idaho and Montana separately from Wyoming, which would be a break from policy of considering the wolf population in all three states together. 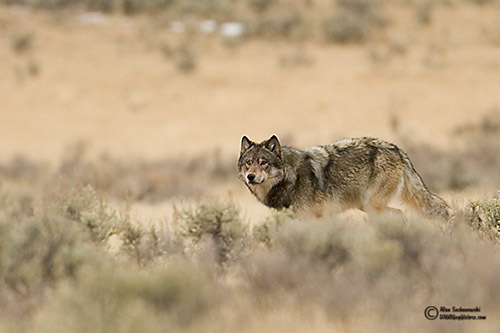 The Fish and Wildlife Service’s wolf reports can be viewed at http://westerngraywolf.fws.gov/.